Paradigms, or conceptual models, have continued to be developed, modified, and integrated since the 1980s. The RCC, arguably the most encompassing of these, has guided a large portion of the research on lotic ecosystems in the interim. However, a number of other models have served to elucidate specific components of running-water structure and function or have proposed alternative broad integrating principles. The major goal of the architects of the RCC was to examine the patterns of biological adaptation that overlay the physical setting (template) of stream/river channels in a watershed. The RCC views entire fluvial systems, from headwaters to their mouths, as continuously integrated series of physical gradients together with the linked adjustments in the associated biota. The RCC was founded on many antecedent studies and many correlates have been incorporated into the general paradigm. Subsequent views and critiques of portions of the RCC also have had significant impact on the present form ofthe RCC as a general model of lotic ecosystem structure and function. This model focuses on the gradient of geomorphological-hydrologi-cal characteristics as the fundamental template along intact catchments upon which biological communities become and remain adapted. This physical template, and biological communities adapted to it, are viewed as changing in a predictable fashion from stream headwaters to river mouth (Figures 5-7). Major generalizations of the RCC involve seasonal spatial variations in OM supply (e.g., algal/detrital biomass), structure of the invertebrate community, and resource partitioning along drainage networks (Figure 8). 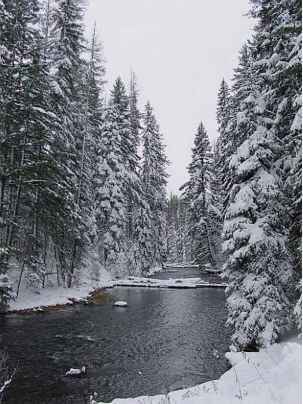 Figure 5 A headwater stream in the Cascade Mountains of Oregon, USA at winter base flow. The coniferous riparian zone provides partial canopy closure and supplies large woody debris to the channel. 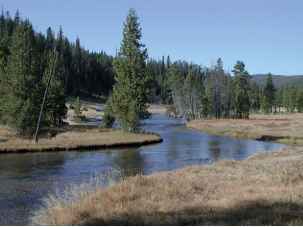 Figure 6 The Firehole River, a mid-sized woodland-meadow stream in Yellowstone National Park, USA. Reduced riparian shading enables abundant growth of in-stream algae. 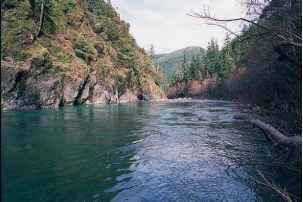 Figure 7 The Smith River in coastal northern California USA. This high order river with a canyon-controlled channel is dependent upon organic matter delivered from the upstream tributary network. habitats and food resources for consumer organisms, and because of overlapping ranges of organisms with evolutionary terrestrial origins (such as the insects) that are dominant in the headwaters with those of marine origins (e.g., annelids and mollusks) that are more prevalent downstream (Figure 9). The RCC has been widely utilized as an organizing principle and has been the subject of many studies resulting in various tests of the concept. As would be expected, a degree of unpredictability in the physical template leads to correspondingly less predictability in the overlay of biological communities. This lack of predictability is often a function of the spatial and temporal scales of reference employed and it can also be induced by human interference. For example, systems may appear more or less variable over time spans ofless than a decade, the time period of observation, but long-term variability, at the scale of centuries or greater, is usually obscured by short-term variations. At least eight paradigms, other than the RCC, continue to guide the development of running-water ecosystem theory (Table 2). These include serial discontinuity, hierarchical scales, riparian zone influences, flood pulse, hyporheic dynamics, hydraulic stream ecology, patch dynamics, and network dynamics. Interruptions in the longitudinal continuum, as proposed by the RCC, are caused by engineered impoundments which serve to reset the general patterns of biotic organization. Above the dam, the system exhibits characteristics of a higher order than the impounded stream. Below the dam, the regulated flows often completely alter the seasonal hydrological patterns of the receiving channel. For example, the normal pattern imposed by the discontinuity resulting from a dam is to decrease the flows during natural high-water periods (reservoir storage phase) and release the water during natural low-flow periods (reservoir release phase). The storage phase retains water to prevent flooding and to provide a later water supply during dry periods. During the release phase, water is delivered for irrigation, drinking, recreation, and, in some cases, to improve fish habitat. In some basins, interruptions in the longitudinal profile of river networks occur in the form of natural lakes or impoundments. Although these may change the sequencing of stream orders, they do not change the annual hydrograph. The hierarchical scales paradigm addresses a weakness of the RCC. The relative significance of the factors driving the physical, chemical, and biological components of running waters changes with scale. The data on which the RCC is based were all collected at the reach scale and during only several seasons. The hierarchical approach recognizes that ecosystem processes operating at the reach scale and over short time periods do not adequately represent the patterns viewed over greater spatial and temporal scales. Therefore, descriptions of stream/river ecosystem structure and function must be placed in the appropriate context of space and time. Several paradigms focus on the ecotones that bridge between the stream/river channel and its surroundings and underpinnings. These include the riparian border primarily along small streams, the aquatic terrestrial interface of large rivers with floodplains, and the subsurface region of the sediments beneath running waters (the hyporheic zone). Figure 8 The 'river continuum concept' (RCC). A proposed relationship between stream size (order) and the progressive shift in structural and functional attributes of lotic biotic communities. The heterotrophic headwaters and the large rivers are both characterized by an autotrophic index, or P/R (ratio of gross primary production to total community respiration) of less than 1 (P/R = <1). The largely unshaded mid-sized rivers are generally classified as autotrophic with a P/R = >1 .The invertebrate communities of the headwaters are dominated by shredders and collectors, the mid-sized rivers by grazers (= scrapers) and collectors. The large rivers are dominated by FPOM-feeding collectors. Fish community structure grades from invertivores in the headwaters to invertivores and piscivores in the mid-sized rivers to planktivores and bottom-feeding detritivores and invertivores in the largest rivers. From Vannote RL, Minshall GW, Cummins KW, Sedell JR, and Cushing CE (1980) The river continuum concept. Canadian Journal of Fisheries and Aquatic Sciences 37: 130-137. Figure 9 Patterns in categories of biotic diversity, from small streams to large rivers, compared on a relative scale for each parameter, as predicted by the 'river continuum concept'. Numbers at the right are general stream/river order ranges. Modified from Cummins KW (1997) Stream ecosystem paradigms. In: CNR - Instituto di Ricerca SulleAcque. Prospettive di recerca in ecologia delle acque. Roma, Italia. RCC, River Continuum Concept; HS, hierarchical scales; RZI, riparian zone influences; FPC, flood pulse concept; HD, hyporheic dynamics; HSE, hydraulic stream ecology; PD, patch dynamics; ND, network dynamics. a, most direct influence on stream biota and ecosystem processes; b, if channels are braided, ranking moves down in c\scale to a lower order; c, beyond the scale to detect specific (local) differences; d, influence too local to detect general, large-scale patterns; e, may be of less direct importance in naturally deranged (lake interrupted) or beaver-influenced stream systems. riparian litter inputs and stream invertebrates is most direct for invertebrate shredders that feed on conditioned litter. The timing of the inputs of litter to streams varies among ecoregions and with the species composition of the riparian vegetation. Roots of riparian vegetation stabilize banks at the edge of the channel and influence the chemistry of subsurface flow into the channel. The width of the riparian zone that encompasses these root functions also varies. Thus, a complete definition of the riparian zone that encompasses all these functions would need to be of sufficient width to accommodate all of them. Just as zones of influence of these riparian functions vary, so do the zones of associated management. For example, if a goal is to manage for the long-term input oflarge woody debris to the channel from the riparian zone to provide habitat structure for fish and invertebrates, all trees tall enough to reach the channel when they fall and large enough to provide habitat structure should be left in place. However, to accommodate variations in channel and bank morphology and the composition of the riparian vegetation, this management would need to be implemented at the reach scale. 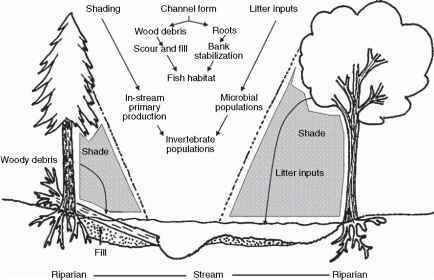 Figure 10 Influences of the riparian zone on streams. 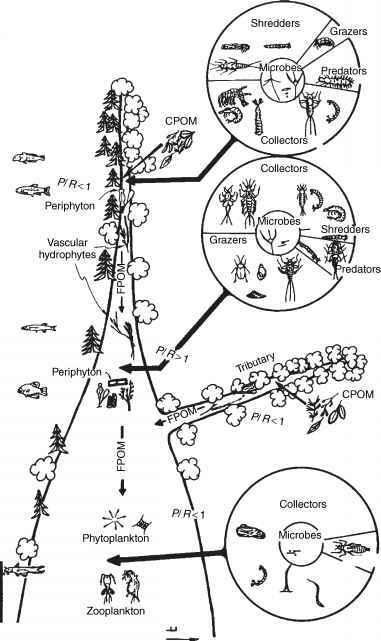 Redrawn from Cummins KW (1988) The study of stream ecosystems: Afunctional view. In: Pomeroy LR and Alberts JJ (eds.). New York: Springer. major river channel and its floodplain. A consequence of this distinction is that the overwhelming bulk of riverine animal biomass derives directly or indirectly from production on the floodplain and not from downstream transport of OM produced higher in the watershed. Although the importance of this aquatic/terrestrial transition zone, the floodplain ecotones, is widely acknowledged, there are few hard data to indicate whether over annual cycles, or longer periods, the primary movement of nutrients and biomass is onto or off the floodplain, or in balance. The general perception of 'fertile floodplains' suggests that the periodically inundated floodplains are sinks relative to the river channel. However, the high productivity of adult fish in many floodplain rivers and the concentration of reproductive activity on the flood-plain supports the notion that floodplains are sources and the river is a sink, gradually exporting to the sea. At any rate, the seasonal pulsing of river discharge, the flood pulse, is the major force controlling existence, productivity, and interactions of biota in river-floodplain ecosystems. For any given storm or series of storms, the movement of material and organisms on to the floodplain follows the rising limbs of the hydrographs, and the return to the river channel follows the falling limbs. Unfortunately, application of the flood pulse concept is restricted because of the wide-scale engineering modifications that have isolated rivers from their floodplains. Natural exceptions to the flood pulse concept are rivers flowing through deeply incised canyons. The hyporheos is the subsurface region beneath and adjacent to stream/river channels that exchanges water with the surface water. This surface water-ground water ecotone is spatially and temporally very dynamic. The conceptual framework of the hyporheic dynamics paradigm has resulted in the incorporation of channel-aquifer dynamics into the general model of the RCC. The hypor-heic zone occurs, at least to some extent, beneath and lateral to the active channel from the headwaters to river mouths, except in bedrock channels. Water, solutes, inorganic and organic complexes, and uniquely adapted biota move through interstitial pathways into and out of the sediments. These flowpaths are determined by the bedform of the channel. Where the bedform is convex, there is groundwater recharge from the channel into the sediments. These locations where oxygenated water is driven into the sediments are often spawning sites of salmonid fishes. Concave bedforms are sites of groundwater upwelling into the channel. Invertebrates found in the hyporheos include the small early instars of a wide range of taxa and larger forms at times of extremes inflow, either high or low. In addition, there are some microbe-nthic forms that are specifically adapted to a groundwater existence. 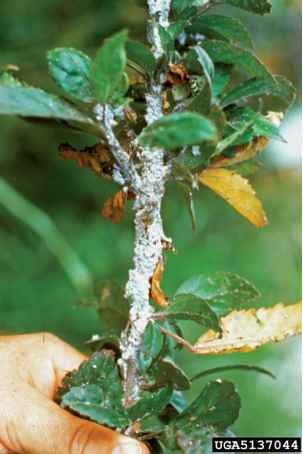 The presence of hyporheic invertebrates is determined largely by siltation and the availability of oxygen. If interstitial sediment spaces are filled with fine sediments and/or conditions are anaerobic, the fauna will be excluded. The hydraulic stream ecology model emphasizes that the local responses of stream organisms to flow conditions can serve as an organizing principle for running waters. Lotic animals are not well adapted to hydraulic stress and can sustain exposure to such stress for only short periods of time. Common patterns of diurnal and seasonal drift of stream invertebrates along vertical gradients of sediment and current velocity are a manifestation of this stress response. The model identifies mean water velocity and depth as more critical than characteristics of substrates in determining the distributions of stream animals. The model has yet to adequately incorporate the extensive data that implicates the diurnal light cycle as the major control parameter of invertebrate stream drift. The patch dynamics concept emphasizes the patchy distribution of riverine habitats in space and time, and argues that an ever-shifting mosaic of patches enables a greater number of species to co-occur than would be the case under greater environmental constancy. Environmental conditions are predictable in aggregate, but not within a particular patch, and these aggregate conditions confer some regularity in species composition. In this model, particular patch types can be found at any point along the general longitudinal gradient proposed by the RCC. However, there are clear examples of invertebrate 'patches' that at least change in abundance from headwaters along the continuum to large rivers. For example, small headwater streams (orders 1-3) are generally better shaded than higher orders (>3) and sustain less suitable algal periphyton to support scrapers. Further, the dominance of the CPOM-detrital shredder linkage correlates with stream width and the close availability of riparian tree and/or shrub litter, and this generally matches with stream orders 1-3. The extension of the shading of per-iphyton growth and the riparian CPOM-shredder linkage to larger rivers can occur along braided channels, but these 'patches' will always be more abundant in the headwaters than in mid-sized or larger rivers. The network dynamics hypothesis, which combines the hierarchical scales and patch dynamics models, is based on the observation that there are abrupt changes that occur at the confluences of tributaries with the receiving channel. Changes in water and sediment flux at these locations result in changes in the morphology of the receiving channel and its floodplain. In this view, the branching nature of river channel network, together with infrequent natural disturbances, such as fire, storms, and floods, are the formative elements of the spatial and temporal organization of the nonuniform distribution of riverine habitats. 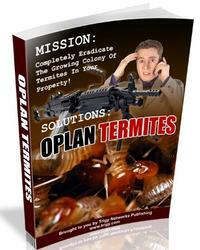 Further, the tributary junctions are proposed hot spots of biological activity. Some data show increased fish diversity and abundance at these junctions, but the influence on other components of the biota has yet to be investigated. 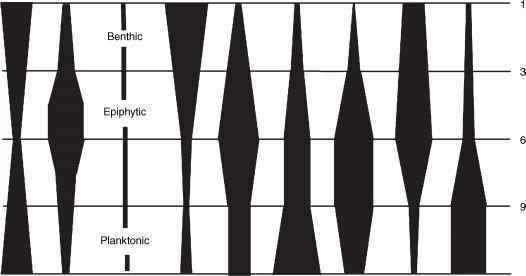 The 'network dynamics hypothesis' does not address 'patches' represented by braided channels. Whether hydraulic characteristics, tributary junctions, or other patch phenomena, represent local conditions that need to be integrated along river continua to account for whole-profile trends that are clearly apparent, or whether such phenomena are localized specific modifiers that differentially affect stream orders along profiles has yet to be demonstrated clearly.